The Friday Masowe apostolics of Zimbabwe refer to themselves as “the Christians who don’t read the Bible.” They claim they do not need the Bible because they receive the Word of God “live and direct” from the Holy Spirit. In this insightful and sensitive historical ethnography, Matthew Engelke documents how this rejection of scripture speaks to longstanding concerns within Christianity over mediation and authority. The Bible, of course, has been a key medium through which Christians have recognized God’s presence. But the apostolics perceive scripture as an unnecessary, even dangerous, mediator. For them, the materiality of the Bible marks a distance from the divine and prohibits the realization of a live and direct faith. Situating the Masowe case within a broad comparative framework, Engelke shows how their rejection of textual authority poses a problem of presence—which is to say, how the religious subject defines, and claims to construct, a relationship with the spiritual world through the semiotic potentials of language, actions, and objects. 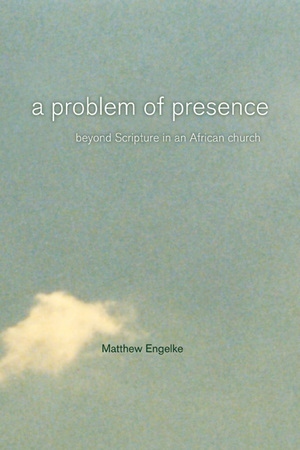 Written in a lively and accessible style, A Problem of Presence makes important contributions to the anthropology of Christianity, the history of religions in Africa, semiotics, and material culture studies. Matthew Engelke is a lecturer in the Department of Anthropology at London School of Economics and Political Science.